How about a woman in the Oval Office who isn’t Hillary Clinton? Elizabeth Warren has a compelling life story that resonates and she isn't from a political family. It was Warren’s vision and persistence that led to the creation of the Consumer Financial Protection Bureau. Her goal of ensuring fair play for and financial safety of the American middle class transcends party boundaries. In a country suffering a hangover from a decade of war, voters may want to know what their leaders will do at home. Warren could surround herself with a cabinet of qualified women, to allay any doubts about her own experience. Editor’s note: In light of current excitement over a potential Elizabeth Warren presidential candidacy, we present an excerpt from our December 11, 2012 essay on the same subject. For any candidate for the Oval Office, what is always key is to have a compelling life story to run on. Elizabeth Warren has that. She is not a professional politician. Unlike Clinton or Nancy Pelosi, the Democrat’s leader in the House of Representatives, she is not part of a politically-connected family. She is from a working-class background, with a father who was a janitor and who, after suffering a heart attack, suffered financial distress from mounting medical bills. Warren grew up in Oklahoma and pulled herself up gradually. She began her academic career in Texas and focused on consumer finance and bankruptcy. She wrote several books, beginning with As We Forgive Our Debtors: Bankruptcy and Consumer Credit in America and The Fragile Middle Class. Her writings also far transcended the academic sector, in particular her 2003 book The Two-Income Trap: Why Middle-Class Mothers and Fathers Are Going Broke. So yes, she is an academic — but she also is a very smart firebrand. She believes in things. She can start campaigns. It was her vision and persistence that led to the creation of the Consumer Financial Protection Bureau (CFPB). Her main issue — ensuring fair play for and safeguarding the financial soundness of the American middle class — can easily transcend party boundaries, and thus has bipartisan potential with regard to the electorate. And even though recent statistics show that individual debt is falling at the fastest rate in 50 years (mostly owing to bankruptcies, however), America remains a nation buried in debt — whether home mortgages, credit cards or student loans. The Consumer Financial Protection Bureau that Elizabeth Warren envisioned has the potential, despite its bureaucratic name, to be very relevant to Americans’ daily lives. In fact, it could become as relevant as the Environmental Protection Agency has become. That is precisely why corporate lobbyists despise both of these institutions so much and miss no opportunity to vilify the people who lead them or champion their agendas. What in Republican times would represent a major liability turns into a badge of honor and credibility in Democratic times. That Elizabeth Warren made the CFPB happen, despite massive resistance from the Republican Party and its donors on Wall Street, is a admirable demonstration of her effectiveness. Thus, unlike the young, pre-presidential Obama, Warren does not have to worry about answering questions about whether she has ever accomplished anything at the federal legislative level. She certainly has. Plus, as the campaign unfurls, many more aspects of Warren’s story would come in handy. She taught children with special needs at a public school in New Jersey and later was a stay-at-home mom before enrolling in law school. These are the kinds of biographical details that connect with Republican-leaning women. OK, none of this adds up to Romney-esque executive experience. Warren also lacks know-how in military and national security matters. But in a country suffering a hangover from ten-plus years of war, voters may be ready to focus more exclusively on what their leaders can do at home. 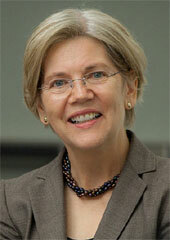 With regard to political reality, Elizabeth Warren certainly has something of an Angela Merkel about her. As the record shows, Merkel has done political wonders in Germany, a country that, like the United States, still has its quite paternalistic side. And she has been very solid in European and global affairs, even though she did not have any prior foreign policy experience. Furthermore, Warren could assemble quite a cabinet of gloriously gutsy women, with a modicum of men thrown in for good measure, that would allay any doubts about her own experience. Imagine Sheila Bair at Treasury. Teresa Sullivan, currently the president of the University of Virginia and co-author of two books with Warren, as Secretary of Education. Esther George as chairman of the Federal Reserve. Or Cecile Richards, president of Planned Parenthood, as Secretary of Health and Human Services. In other words, President Warren could quite easily assemble an administration that would give ordinary Americans hope that the system won’t always be rigged in favor of the moneyed classes. She can give the lower-middle class reason to believe in such a thing as the American Dream. They know she cares about them and that she has — and will — fight for their material interests ferociously.